You are here: Home / Uncategorized / All You Magazine Deal only good till July 30th! Hurry! All You Magazine Deal only good till July 30th! Hurry! So Guess what folks?…. 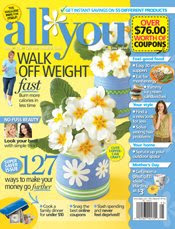 I thought we all had forever to order my All You Magazine 2 year subscription for $16.99. But the price of the All You Magazine beginning August 1st will be going up A LOT in price (double I have heard). So ,if you’ve been considering subscribing to All You or you know someone who would really appreciate a gift subscription, if you have the money in your budget to take advantage of this offer, don’t delay. To get the $16.99 price for 2 years you will need to have your order in and paid for by July 30th. 3. Fill out the form and tell her you want to order the 2 yr. subscription of All You Magazine. Also tell her you are a reader of the “Fistful of Coupons“ site to get the discount! 4. Lauren will contact you and let you know when you can expect to receive your first issue! And That’s it! This is a fantastic deal for us!! The Dr. Pepper deal did not work at the Gage store. It’s not part of the Buy 2 Get 2 deal. If you already got that great deal, can you tack on another two years by ordering again?